Police used plastic bullets and water cannon to disperse crowds of rioters in Belfast as they attacked officers with bricks and petrol bombs. The city council said no protest would make them overturn recent limitations on displaying the British flag. ­According to varying estimates, between 400 and 1,000 loyalists gathered in front of the city hall on Monday for a protest, marking the fifth consecutive night of demonstrations. The peaceful gathering turned violent as a group of 250 was leaving the rally and clashed with a group of republicans. Police tried to keep the two conflicting parties apart by using water cannons and firing plastic bullets. Five plastic bullets were discharged due to the "level of violence" to which police were subjected, the Police Service of Northern Ireland said. Officers were attacked with stones, petrol bombs fireworks, paint bombs and other missiles, while some protesters were armed with hatchets and hammers. Rioters erected a barricade on a street and set it on fire. Protesters were also damaging cars and two cases of attempted carjacking were reported. Four protesters, two men and two women, were detained for public order offences on Monday, bringing the total to some 100 arrested since the beginning of the month-long conflict. This includes a man who was arrested last week on suspicion of attempted murder. According to police, children as young as 10 and 11 were taking part in the rioting. Northern Ireland`s commissioner for children and young people, Patricia Lewsley Mooney, expressed her deepest concerns on the situation explaining that criminal convictions given to children could affect them for the rest of their lives. Northern Ireland's chief police officer Matt Baggott accused pro-British militant groups of inciting violence and instigating the riots. 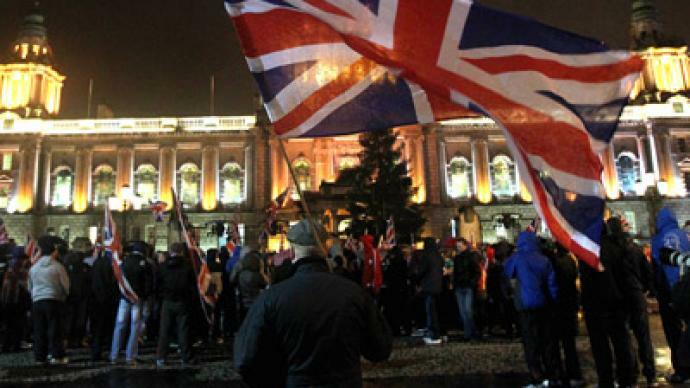 The so-called flag riots began in December after the city's council limited the number of days the British flag is to be flown over the City Hall of the Northern Irish capital. The vote stipulated that the flag, also called the Union Jack, is to fly on 18 designated days only, rather than year-round. 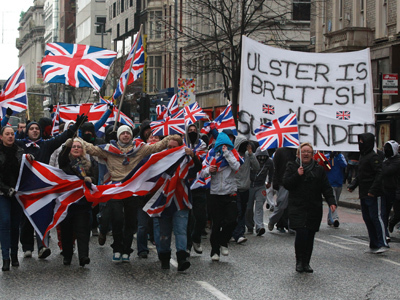 The decision inflamed loyalists, who took to the streets of Belfast in large numbers to protest against the change. 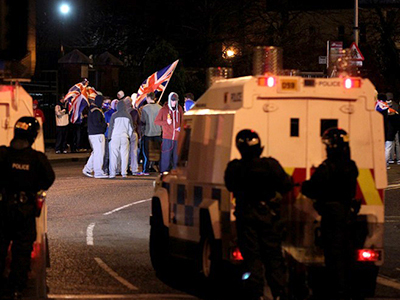 The demonstrations soon turned violent with loyalists and republicans attacking each other and police. 62 police have been injured in the clashes since the protests began. Monday also saw the city council meeting for the first time since the controversial vote took place last month. The city officials spent about an hour discussing the situation around the newly-adopted flag regulations. Wednesday, the Duchess of Cambridge's birthday, is going to be the first of the designated flag days, when the British flag will be legitimately flown over the building. Meanwhile, some say the flag-riots are a vivid indication of growing tensions between Catholic republicans, who seek reunion with Ireland, and Protestant loyalists, who want to remain under British control. 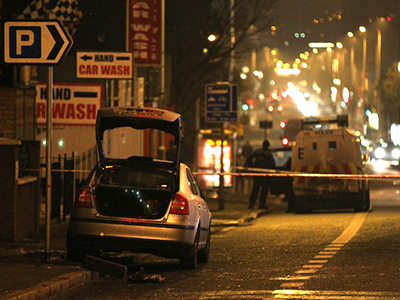 The current rioting is the worst Belfast has seen since the Belfast “Good Friday” Agreement, signed in 1998, ended 30 year conflict between the two sides. Peter Shirlow, from the Institute for Conflict Transformation, told RT that the flag protest has merely been a catalyst for problems that have been simmering in east Belfast for the last two years. “There have been problems in this area of east Belfast for the last two years and there are people [unionists] within that organization who are engaged in this violence. There is another problem in Northern Ireland on the other side of the house as it were, what we call dissident republicans who want to create a united Ireland and they have been involved in a series of bombing attacks and shootings in the past few years,” he said. He added that the Unionists who instigated the rioting argue that the peace process has stripped away their cultural identity and their ‘Britishness’ is under threat. “It’s not an opinion shared by everybody within the unionist British population, buts its certainly shared by those who are anti-peace process, who wish to destroy the efforts that are being made to change this society and make it much more civil and equality driven. They are essentially people who have a form of cultural fascism,” he said. Naomi Long, MP for Belfast East and member of the Alliance Party, which represents wider liberal and non-sectarian concerns in Northern Ireland, explained to RT why the decision by Belfast City Council not to fly the Union flag has been so incendiary and why it may also be dangerous for the future of the troubled province. “Clearly we understood that people would find this a very sensitive and emotive issue. Issues of identity in a divided society are incredibly potent. So we did recognize that there was a problem. Nationalists on the council want the flag not to fly at all; Unionists want it to fly every day. What my colleagues in the council did was propose a compromise solution,” she said. “We have tried to behave in a way that is responsible and mature around what is a difficult issue. But we have a contested space in Northern Ireland and we have to find ways of living together, of expressing our identities in ways that our not confrontational, but that are actually inclusive and welcoming,” she continued. She explained that the reason this issue is so contentious is because it gets to the very core of whether people view themselves as Irish or British. The Alliance Party has a neutral position on the question of either a united Ireland or continued Union with Great Britain and continues to argue that power-sharing by the coalition government in Northern Ireland entrenches division rather than providing a basis for overcoming it.